Here is the set of data to take a look at. This is what I did to start to make this better. 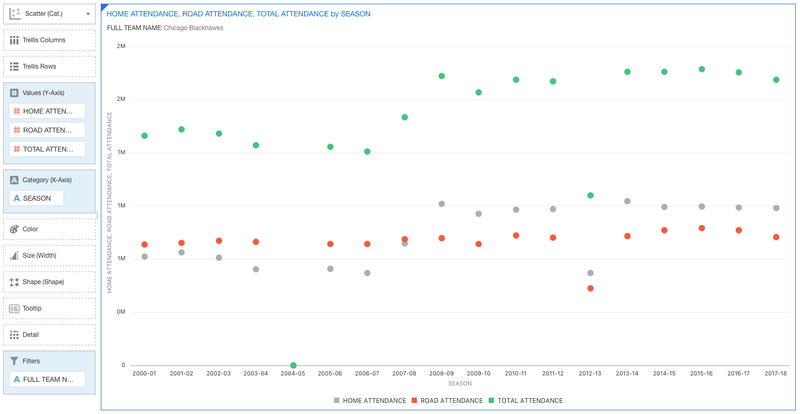 I did notice that the overall Total Attendance starting from the 2000-01 season has gone up. That can be seen from this simple Line chart that I created. 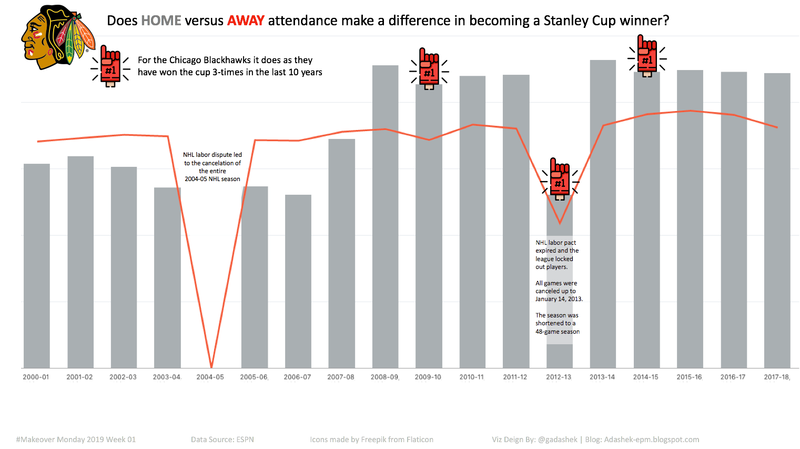 The original data set did not include the 2004-05 season. So I added that to the data in order to show a full and proper picture of the seasons over time. 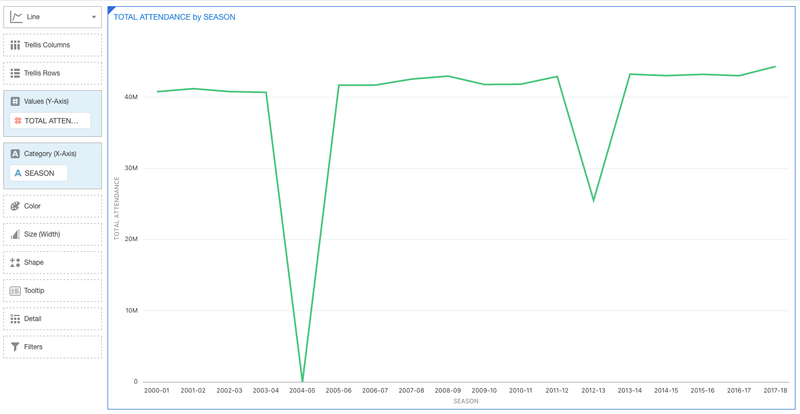 You can see the line chart drop to 0 that season. If you simply take that off of the Total the attendance would actually be lower than the previous year of 43.050M versus the adjusted amount of 42.875M. You can see that with the Parallel Coordinates chart by adding a few filters. Filter for showing only the 2 seasons in question as well as removing Vegas. 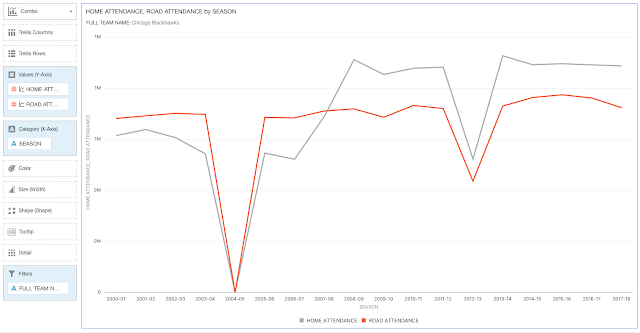 So I was able to answer the MM question for myself that with just the simple attendance totals, yes, attendnace did go up but that is not entirely fair to simply state since there was another team added to the league last year that skews the data. 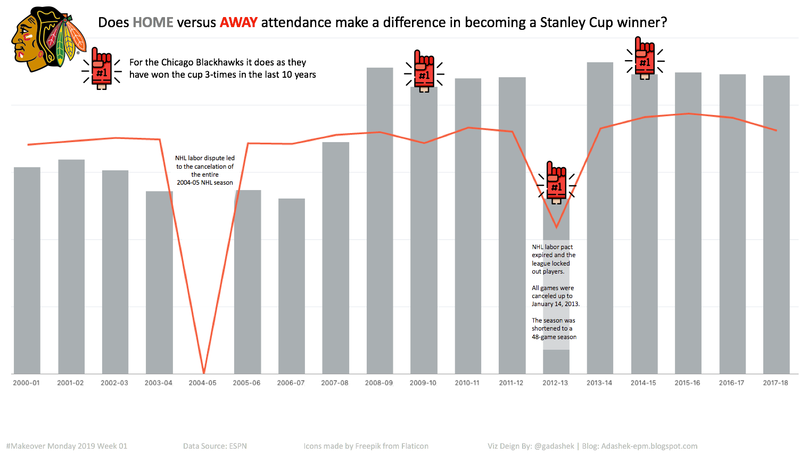 But I wanted to take a deeper look into the data for my favorite team, the Chicago Blackhawks. Maybe there was something interesting I could find. I picked a few Attributes as well as Measures to start. 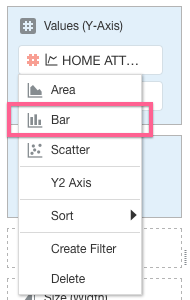 To select more than 1 at a time, hold down the control/command key while you make multiple selections. Once I had what I wanted, I then wanted to find out what DV thought would be the best. 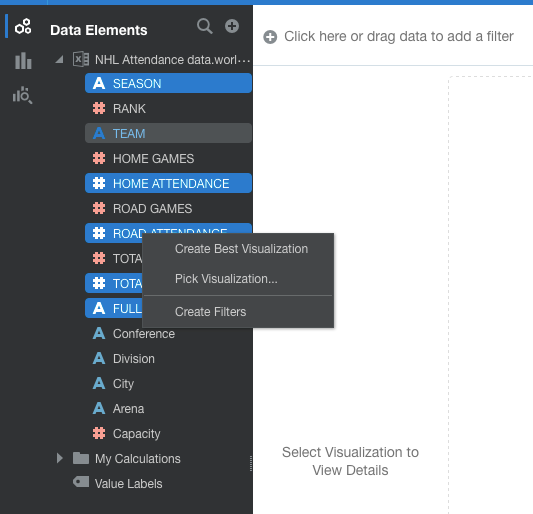 While the multiple selections are made, Right-Click and select "Create Best Visualization", just that simple. Looks like a mess in my opinion. 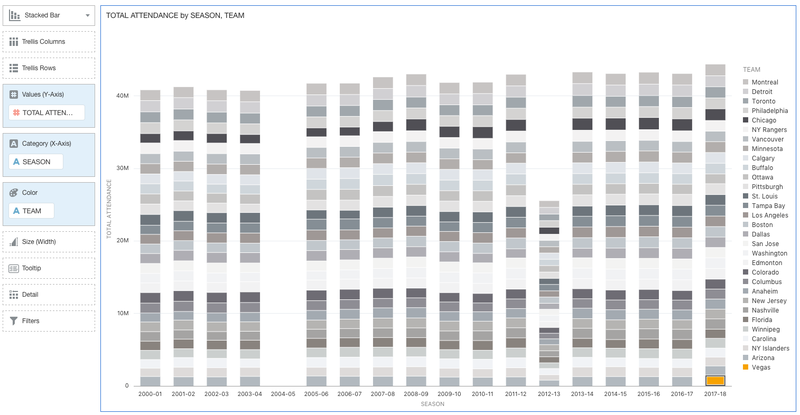 Time to start making changes but leaving alone the Viz Type as Scatter (kind of). I changed the Viz type to "Scatter (Cat.)". This allowed me to group the measures together on the Y-axis and display the Seasons over time on the X-axis. This was the result. There are a few things that I noticed. It does look like the attendance all around (Total, Home & Road) was going up. 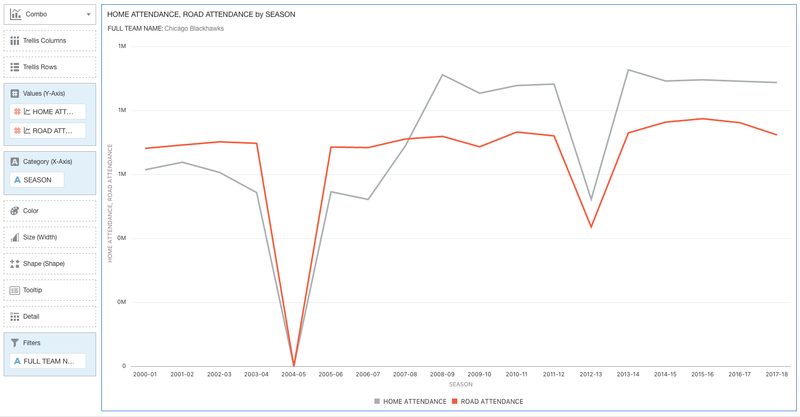 But there was something else, if you look at the Red (Road) and Grey (Home) attendance there is a "flip" after the 2007-08 season, meaning that the Home attendance is more than Road from that year onward. Wanting to highlight this as a part of my final Viz, this was going to help be the baseline. 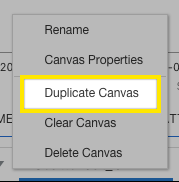 With that, I right-clicked on the Canvas name and selected "Duplicate Canvas". 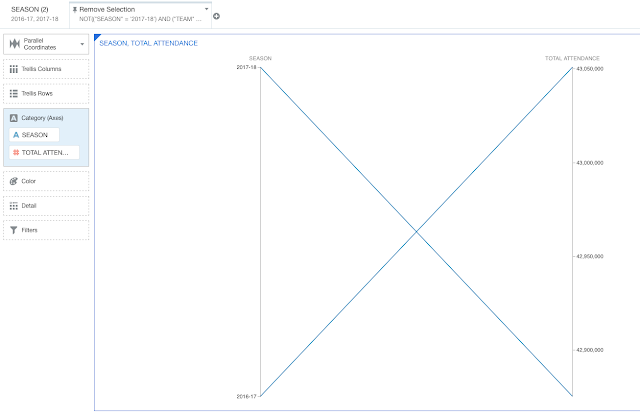 I then changed the Viz Type to "Combo" and removed the Total Attendance. 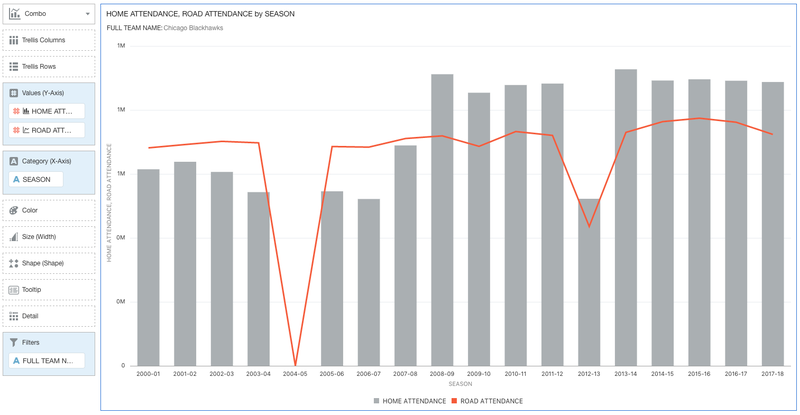 You can see with Lines that the trend does go up and there is a season as mentioned before that Home exceeds Road attendance. To make the data easier for the reader to distinguish this fact about the data, I made a change to the HOME #Values. The change was to make this a Bar instead of a Line. 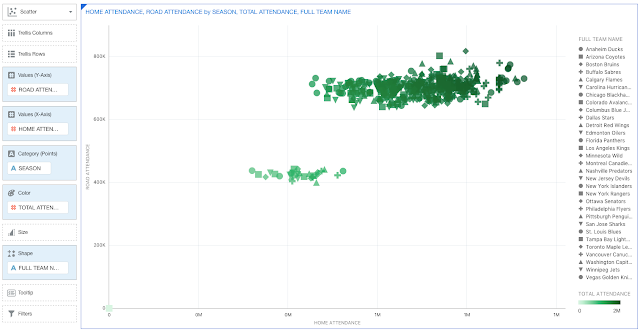 Do do this I right-clicked on the HOME ATTENDANCE #Value in the Y-axis assignments section and selected "Bar".